Please confirm the following specification when you visit the site. Screen Resolution:1024*768 pixels or above. Recommended Browser: Internet Explorer 10 to 11, Chrome latest. Note: No verification test has been done for other browsers. The cycle time for update is 5 minutes. To view the latest data, click the key "Refresh"on the tool bar. The update may halt temporalily due to radar maintenance or other inspection. Discriptions in the table below refer to the situation on the ground as generalized image for each rainfall intensity. It should be noted that radar meaures the intensity high above the ground, which is not necessarily consistent with the intensity low on the ground. Feel like buckets of water poured over Puddles make a road like a river Risk for hydroplaning (Occurrence of water film between wheel and ground) Mudslides or even landslides are prone. Preparation for evacuation is necessary in dangerous zone. Overflow from discharge pipelines in cities. Feel fright with choking pressure Large-scale disaster is possible. Data quoted from Japan Meteorological Agency (Data as of August, 2000, revised in July,2002). The table assumes the continuation of one-hour for each rainfall intensity. The degree of disater varies with conditions of initial intensity or topological feature. The descriptions are based on recent cases.. Alteration should be done for deviation from actual situation. displays JR Lines in the map. displays other companies’ line, subway is not included. means the place of each station. 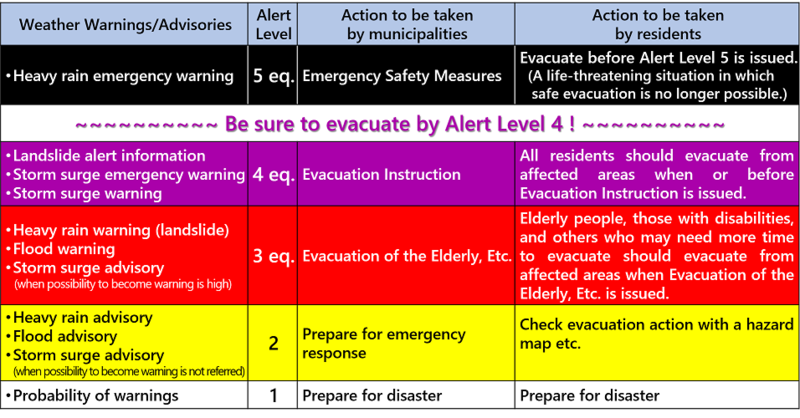 Japan Meteorological Agency issues heavy rain emergency warnings/warnings/advisories to call attention or precaution expecting damage possible. All types of information written below will be shown in this site when announced by JMA. Diversion of the homepage data to another purpose requires our consent. The user assumes the entire risk related to its use of homepage data. In no event, will we be liable for damages or lost profit resulting from any use of the data. Please send your commments to:.